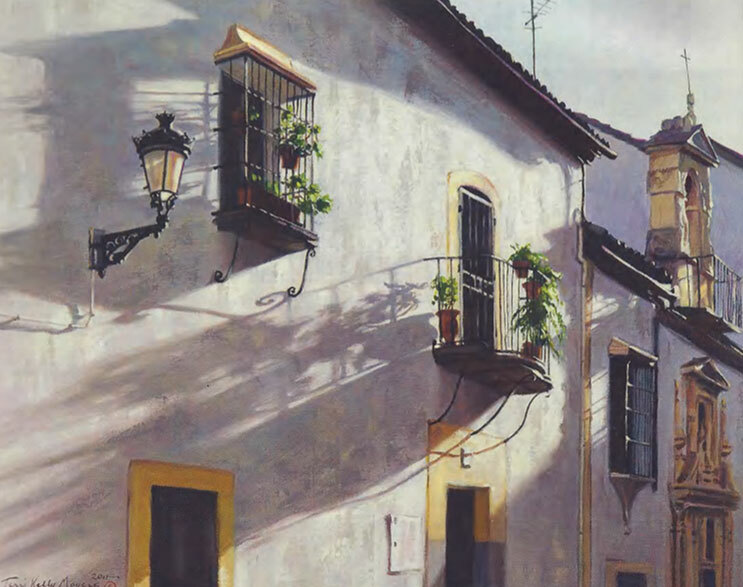 Terri Moyers, Balconies of Cordoba, Oil on Canvas, 24" x 30"
All Over the Map. 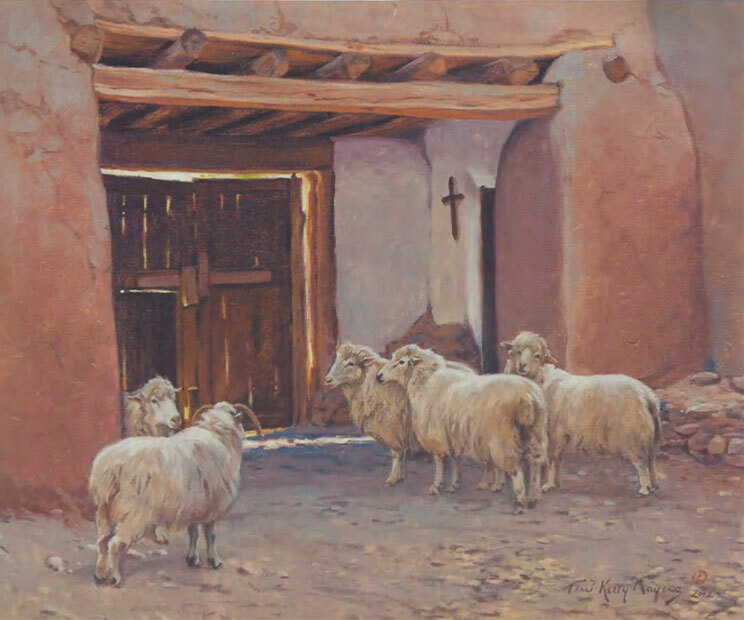 That’s the name Nedra Matteucci Galleries in Santa Fe came up with for the August 11 - September 1 show featuring new works from plein air painters Terri and John Moyers. 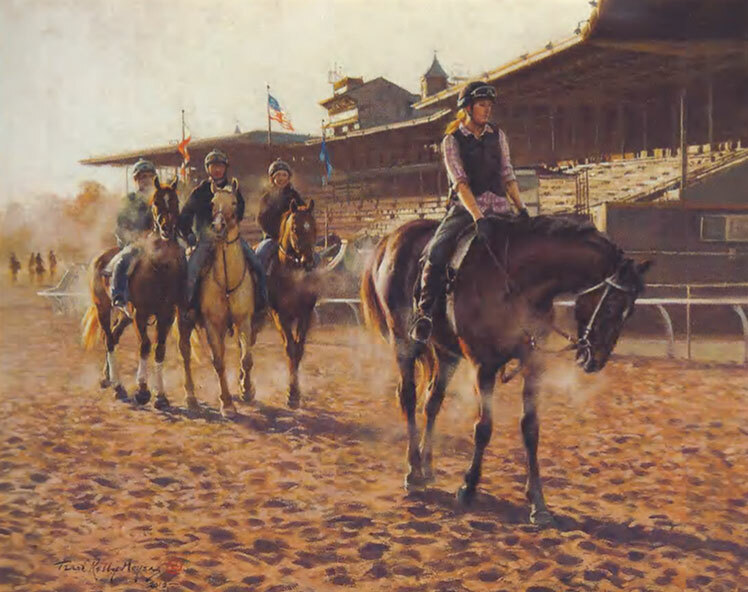 Terri Moyers, Morning Exercise - Santa Anita, Oil on Canvas, 24" x 30"
John Moyers, Spring Pilgrimage - Taos, Oil on Canvas, 48" x 48"
John Moyers, Hombre, Oil on Board, 30" x 15" Terri Moyers, Old Santa Fe, Oil on Canvas, 40" x 30"
“There are a group of collectors that do like to col­lect them both,” says Medicine Man Gallery owner Mark Sublette, “but both have their own set of fans and collectors. Some really love Terri’s material, and that’s what they focus on. 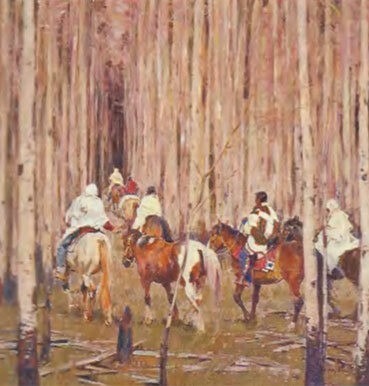 And some are more for John, but it’s not uncommon for collectors to collect them both, as I do.” They can be painting the same subject, but see things completely different. “John has broader brush strokes,” Matteucci says. “He paints in a different light. Terri might have a painting of a woman putting on an embroidered shawl, while John will have a man getting ready for battle. 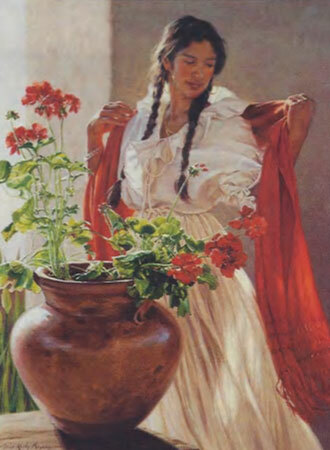 But the paintings complement each other, showing each getting ready for their next mission.” John loves painting figures from the Mexican Revolution. Terri’s first loves are horses. John’s more historical. Terri’s more feminine. But ask them what they want to paint, and their answers are definitely not all over the map. Terri Moyers, Churro, Oil on Canvas, 20" x 24"
“I think it’s so important for an artist to paint what they’re excited about,” John says, “and so you always do your best work if you’re painting things you’re excited about painting. Every artist falls into this trap because you have to make a living, too. You might paint something because you’re thinking, ‘I have to make some money,’ but it’s never as good if you’re painting for that reason.” “That’s the beauty of a gallery show,” Terri says. “It seems that the major art shows are Western shows, but the beauty of a gallery is that you can show all kinds of stuff. That excites us. And, you know, because we’ve always done a variety, people don t expect just one thing. It’s successful for us." 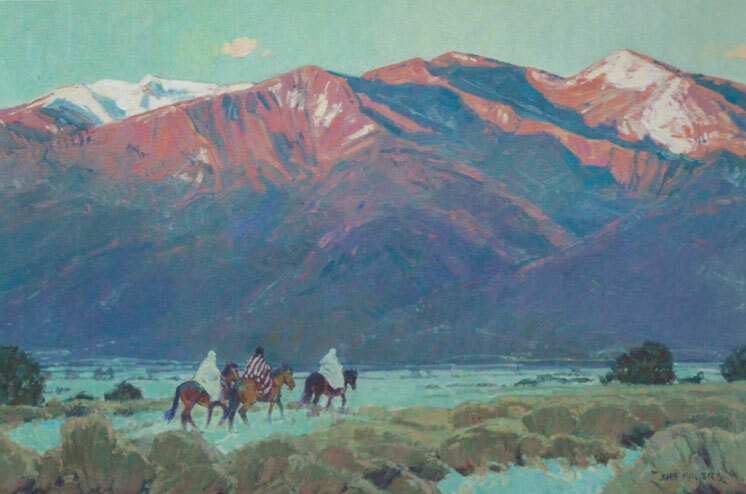 John Moyers, The Sangre de Christos, Oil on Board, 24" 'x 36"
Johnny D. Boggs is an award-winning Western novelist based in Santa Fe, New Mexico.